Boil the milk. Once it is well boiled, reduce the flame and slowly add the lime juice or vinegar till the milk starts curdling. Stir the milk slowly till the milk curdles completely. Switch off the gas and pour the curdled milk (chenna) on a muslin cloth. Pour the ice water over the chenna in the muslin cloth and wash well so that the sourness due to the vinegar will go away. Drain out all the water and hang the cloth at least for 20 min so that all the water is removed. Now your chenna is ready. Knead the chenna and fine sugar till the sugar incorporates with the chenna. Add the rose water and mix well. Make small balls flatten them and create a small dent in the center. Sprinke saffron water on that dent and place your nuts on top. 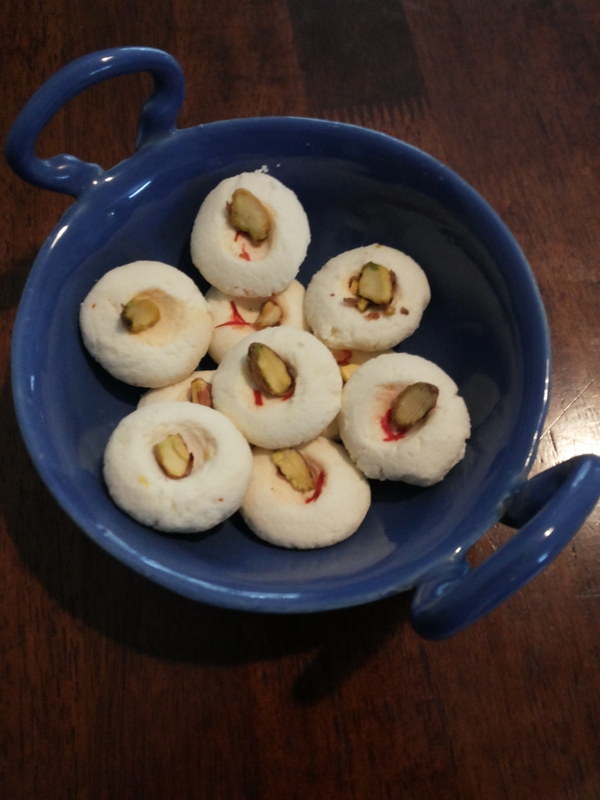 This is not an authentic way of making Sandesh, but easy way of making it It tastes as good or even better.